Explanation: This beautiful telescopic skyscape features spiral galaxy NGC 918. The island universe is about 50,000 light-years across and lies some 60 million light-years away toward the constellation Aries. An artistic presentation, the image shows spiky foreground stars in our own Milky Way Galaxy and convoluted dust clouds that hang hundreds of light-years above our galactic plane, dimly reflecting starlight. 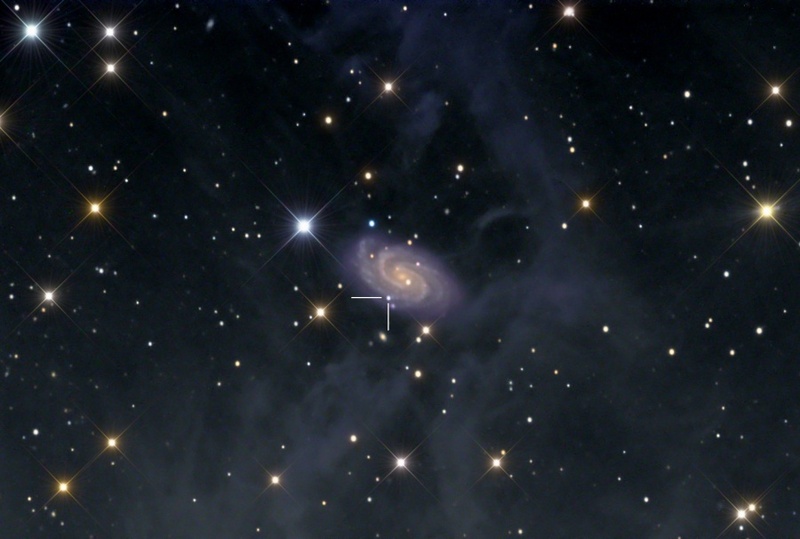 It also captures NGC 918 in a cosmic moment important to astrophysicists on planet Earth. Light from supernova SN2009js, absent in previous images, is indicated by the two lines just below and left of the galaxy's center. The supernova itself is the death explosion of a massive star within the plane of galaxy NGC 918. It was just discovered in October by supernova search teams in Japan and the US.